What is Comparative and Evolutionary Physiology? Physiologists study the basic mechanisms that allow an animal to move, breathe, eat, circulate material within the body, reproduce, and regulate the composition of its fluids. These studies can be done at many levels of biological organization, including the whole body, of individual organs or organ systems, of tissues, and of individual cells. Comparative physiologists are a group of animal physiologists who seek answers to questions related to the diversity of physiological functions across different groups of animal taxa. They are often drawn to species that perform extreme physiological feats, such asnbar-headed geese, which may fly over Mt. Everest, adult kangaroo rats, who need not drink water, elephant seals, which can dive a kilometer for many minutes, or wood frogs, which can survive half of their body water being frozen. They may also study relatively basic aspects of animal physiology, such as how the heart of a fish works, with the ultimate aim of determining how evolutionarily conserved a process or function may be. These evolutionary physiologists might also seek answers to questions about how these processes have or have not changed across different time scales. On a macroevolutionary scale, they may ask why, when, and how warm-bloodedness (endothermy), the four-chambered heart, or air-breathing came to be. On a microevolutionary scale, they may ask how complex physiological systems change within and between populations over generations in response to selection pressures such as oxygen and water availability or temperature extremes. An animal's physiology determines its performance limits. The speed an animal can run, fly or swim, the temperatures it can tolerate, or its ability to survive without water or oxygen are all determined by its physiological limits. An animal's physiology directly affects how it interacts with its environment. Consequently, understanding an animal's physiology allows us to predict how it might respond to environmental perturbations, such as a drought, famine, or extremes in temperature. Fortunately, many animals have changed their physiology over evolutionary time to manage many different kinds of environmental extremes and stresses and in very many cases, species have become very specialized and especially well-adapted to environmental stress; so much so that we, as humans, look to them to better understand our own limits in physiological performance. Our laboratory is especially interested in questions related to the function and evolution of the vertebrate cardiorespiratory system, particularly in ectotherms. The vertebrate cardiorespiratory system is comprised of the heart, blood, the gas exchange organs (e.g. lung, gills or skin), and the metabolic processes involved with energy production found in all living cells. The functioning of these components is affected by a variety of factors, especially an animal's body temperature. Most animals on Earth are ectothermic, which means that the principal source of heat determining body temperature comes from the environment. In contrast, endothermic animals, such as ourselves, rely mainly on the heat derived from the chemical bonds in the food we consume. Although endothermy can be found among some fishes and possibly some reptiles, it is principally a trait of birds and mammals. 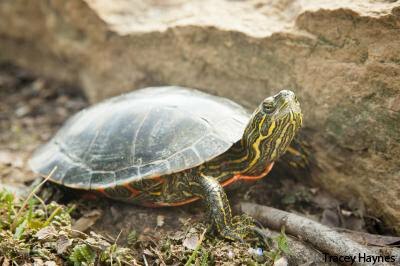 Our research is directed at understanding the function and evolution of the cardiorespiratory system of pond turtles, ectotherms that can tolerate a wide range of temperatures and oxygen availability. For information about our present research projects, click here.